Hurricane Sandy ripped through the Bahamas with 100-mph winds on Friday. It is now headed straight for the East Coast of the United States. The storm is dominating the news cycle and pushing election coverage to the sidelines as Romney takes a marginal lead, according to establishment polls. “With President Barack Obama and Mitt Romney on center stage next week, the storm’s aftermath could affect voting logistics, travel, and even the volume of campaign TV advertising,” writes Scott Bombay for Constitution Daily. It may also present itself as the October Surprise many have predicted for this year’s presidential election. Obama needs a serious boost following his lackluster performance during the first presidential debate. Sandy may very well be his “divine wind,” or Kamikaze, the typhoons that saved Japan from two Mongol fleets under the command of Kublai Khan. If Sandy strikes Virginia, Maryland, Pennsylvania, New York and New Jersey, it will undoubtedly produce widespread chaos and present an ideal opportunity for Obama to come off as a strong and decisive leader marshaling FEMA and the federal government’s “emergency management” apparatus into action. Following the “perfect storm,” the establishment media will naturally provide all the propaganda Obama needs to sweep the election on Tuesday, November 6, a week after the hurricane is projected to hit. On Thursday, weather forecasters said there is a 90 percent chance on Monday the East Coast will take a direct hit from a “perfect storm” of three different systems produced by Hurricane Sandy, an arctic front and a jet stream, according to ABC News. Scientific research has demonstrated that the ionosphere plays an important role in hurricane dynamics. Dr. Nick Begich and Jeane Manning are experts on HAARP and its military application. “Put simply, the apparatus for HAARP is a reversal of a radio telescope; antenna send out signals instead of receiving. HAARP is the test run for a super-powerful radiowave-beaming technology that lifts areas of the ionosphere by focusing a beam and heating those areas. Electromagnetic waves then bounce back onto earth and penetrate everything — living and dead,” they explain. On a less grand scale, scientist in have worked to create rain in Abu Dhabi’s Al Ain region using giant ionizers. The Pentagon’s HAARP, or High Frequency Active Auroral Research Program, is not required to modify and direct hurricanes, however. As weather modification expert Ben Livingston, who has a degree in cloud physics from the Naval Weapons Center and Navy Post Graduate School in California, told Alex Jones in 2005, hurricane behavior can be modified by seeding clouds with silver iodide. The University of Colorado and others have published reports on the effectiveness of cloud seeding. Ben Livingston “seeded clouds and dramatically increased rainfall in his theater of war, creating impassably muddy roads, slowing down the Vietnamese and Korean troops, and saving lives and entire towns from occupation,” Paul and Steve Watson reported on October 14, 2055. 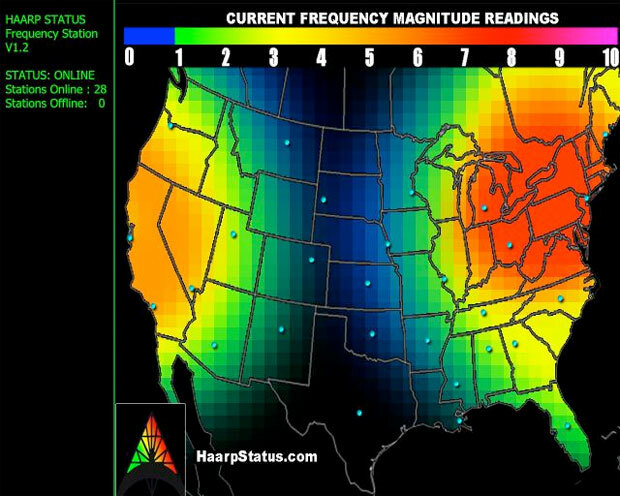 If the research conducted by HaarpStatus.com is correct, the government (or factions within) are manipulating the ionosphere and driving Sandy into the East Coast to create chaos and Katrina-like post storm conditions that will have significant political ramifications during the November 6th election. It is not clear why the ruling elite want to make Obama look presidential at Romney’s expense, however. Both candidates are preened race horses for the ruling global elite and with a few notable exceptions their agendas are almost identical.